The Great Depression began with the stock market crash on October 27, 1929 and lasted until the production boom that accompanied the onset of World War II. Franklin Delano Roosevelt developed the federal New Deal programs in 1933. These programs became the “alphabet soup” agencies, created with the intent to stimulate the economy, help the unemployed and reform the country’s financial system. One of these New Deal programs was the Civil Works Administration (CWA). The CWA formed under the auspices of the Federal Emergency Relief Administration (FERA), to create temporary jobs for the unemployed. The first federally funded program to help artists was the Public Works of Art Project (PWAP), which began in December 1933. The basic premise of the program was that artists should have the same production and public value standards as laborers in other CWA projects. Artists were recruited through ads in newspapers and had to prove that they were professional artists who passed a financial needs test. The only guidance about subject matter was that artists should consider the “American scene” as a suitable topic. Painters and sculptors applied for commissions and received classifications as either “A” or “B” artists based on ability, training and past work. Ten Memphis artists received commissions. The PWAP preceded the better known Works Progress Administration (WPA) by more than a year. The WPA also funded artists, writers and entertainers. Burton Callicott was born in Terre Haute, Indiana in 1907. He trained as a sculptor at the Cleveland School of Art, graduated in 1931 and moved to Memphis. Callicott’s stepfather was Michael (Mike) Abt, the director of the western division of Tennessee’s CWA/PWAP committee. Callicott was classified as an “A” artist, which meant that he was to be paid $42.50 per week. He received a commission to paint a single-panel mural showing De Soto’s exploration of West Tennessee for the center alcove above the Pink Palace Museum’s lobby staircase. Callicott suggested painting the mural as a fresco, but the committee wanted it done on canvas so that they could remove it later if they wanted. He researched the subject matter and spent the next several weeks sketching The Coming of De Soto, which includes officers on horseback, foot soldiers, dogs and Death, as symbolized by the figure with the skeletal hand. He finished the pencil drawing in January 1934. The committee then asked forsketches for two more panels. In February, Callicott completed the left panel, Conflict with the Indians. It depicts a symbolic conflict between the invading Spaniards and the Indians. He finished the drawing for the right panel, The Discovery of the Mississippi River, in spring 1934. Instead of depicting a joyous triumph, Callicott chose to paint the scene as a sober event filled with tired men faced with a physical barrier. He also alluded to De Soto’s death on the other side of the river by having the shape of the tree line on the Arkansas side echo the shape of the prone figure at the top of the Conflict with the Indians panel. Callicott and Harry Dixon, his assistant, began painting the first mural in summer 1934. The men built canvas stretchers on the lobby floor and then attached the panels to the wall. Callicott used a chalk snap line to create one foot sections on the canvas. He then used his pencil drawings, divided into one-inch squares, to copy and enlarge the design onto the canvas panels. Callicott used charcoal for the outlines on the canvas. The colors were chosen to harmonize with the existing lobby. Dixon color mixed the large quantities of oil paint that they needed. He stored the paint in toothpaste tubes so that it wouldn’t dry out. It took about six weeks to finish the first mural. The Park Commission never reimbursed the men for the materials they purchased, which meant that they had to pay for paint, canvases and stretchers out of their PWAP stipend. Each remaining mural took about six weeks to paint, which means that the entire project took about one year—including drawing time and bureaucratic delays. In November 1984, the Pink Palace hosted a reception for Callicott marking the 50th anniversary of the murals. The museum presented him a check for $167.80 for the cost of the materials he bought to produce the murals. Callicott decided to donate the money back to the museum to start a restoration fund for the murals. 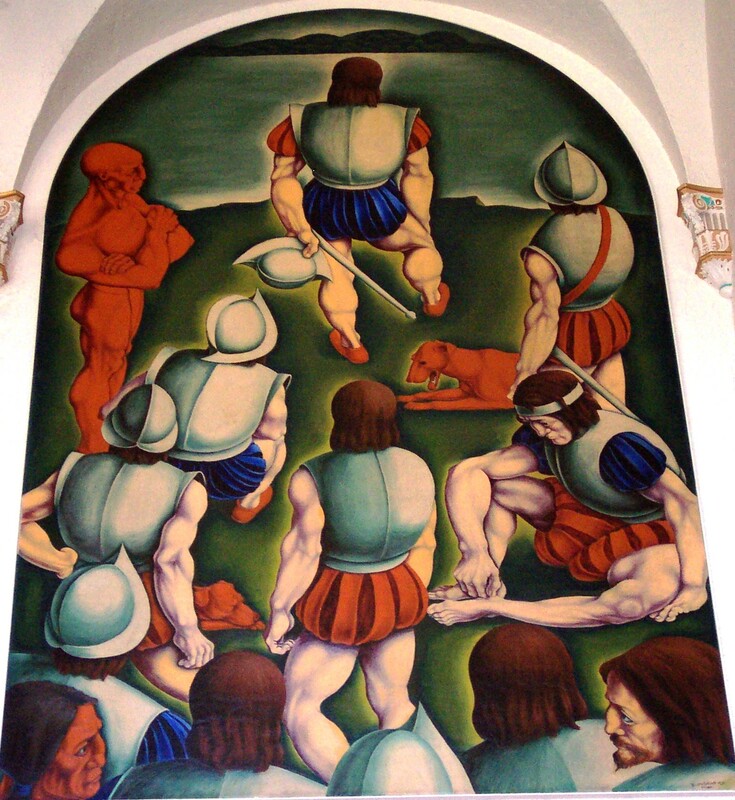 In early 1995, the murals were restored and framed as Burton Callicott had originally recommended. These murals are beautiful. Very special, very Memphis!